I'm pleased to announce that my short story, "More than Bargained For," has been published in the anthology Make A Wish, a collection brought to us by Static Movement that focuses upon the darker side of wish fulfillment. More than Bargained For is a tale about a down-on-his-luck serial optimist who unwittingly strikes a bargain that changes his life for the better...temporarily. For sentimental reasons, I'm pleased to see the current version of this particular story brought to print, as it is one of my earlier works [in fact, the second short story I ever wrote]. 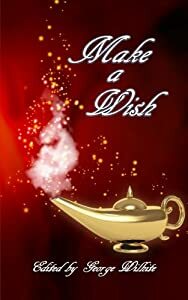 Make A Wish is available via Amazon.com. Click HERE to purchase.